Howdy, Matt Wedel here. This is the Sauropod Vertebra Picture of the Week (or SV-POW! as we like to call it), and you just got a post yesterday, so what are we doing back here already? Mike and Darren and I are trying to get SV-POW! up and running as quickly and smoothly as possible, and the best way to do that is to post. And as long as we’re posting, we might as well get a little work done, too. Today we’re covering the very basics of vertebrae. You’ve been toting around a full set for your entire life, but just in case you’ve never gotten acquainted, here’s the skinny. Vertebrae are the segments of bone or cartilage that make up the spinal column or backbone. In sharks and rays the vertebrae are composed of cartilage, but in almost all of the bony fish and their descendants–including you–the vertebrae are made of bone. Cervical vertebrae are neck vertebrae. They usually have fixed (non-mobile) ribs on either side. You may not know it, but your own cervical vertebrae have these ribs. They’re just very short. In some sauropods the cervical ribs were mind-bogglingly long, up to 4 meters or more in length, but that’s a story for another post. With a couple of weird exceptions, all mammals have only 7 cervical vertebrae, even the giraffe. But other clades are not so limited. For example, birds can have 24 or more. The largest number of cervical vertebrae in any known sauropod is 19. Caudal vertebrae are tail vertebrae. There is usually more change along the caudal series than in other regions of the vertebral column. The vertebrae closest to the sacrum often closely resemble unfused sacral vertebrae, but down at the end of the tail the vertebrae are usually reduced to simple rods or nubs of bone. Your coccyx or tailbone is made of fused caudal vertebrae, so technically you do have a tail skeleton, just not an external tail (unless you’re lucky). Well, that’s quite enough for now. We’ll take up the parts of a vertebra in a future post. And it won’t all be anatomical drudgery; we wouldn’t have created SV-POW! if we didn’t have really cool stuff to show off. The skeleton in the image above is that of Brachiosaurus. The cervical vertebra, BYU 12867, is also from Brachiosaurus, and it is 94 cm long. The dorsal vertebra, OMNH 1382, is from Apatosaurus, and it is 93 cm tall (however, the top of the neural spine is missing so it would have been more than a meter tall in life). * Some sauropods might have more dorsal vertebrae or fewer sacral vertebrae, depending on the definition of ‘sauropod’ that one uses. Right now it seems that at least some of the animals traditionally called prosauropods are, in fact, primitive sauropods. Excellent — handy introduction, Matt, thanks. But why didn’t you use one of the very many handle Brachiosaurus dorsal vertebra photos I’ve sent you through the years instead of Apatosaurus? Partly because I stole this figure from another general-audience piece I’m working on, and for that it made more sense to use the Apatosaurus. Hmmm. Looks like I’m the first person who’s not actually writing this blog to comment here. This post was a good one. The two pics of the dorsal vertebra show the openings in the bone better than any I’ve seen elsewhere (in the full scale image). Beautiful photography. It would be nice if there’s a way to have a link to this post (and to any other that lays out basic terms needed to understand the cool stuff) on the main page so that us ignorant laymen can refer back to it easily while reading a future post that assumes familiarity with the terms. Who-hoo! Thanks for the kind words. I think ZZ Top may have had this very moment in mind when they wrote “I’m bad, I’m nationwide”. 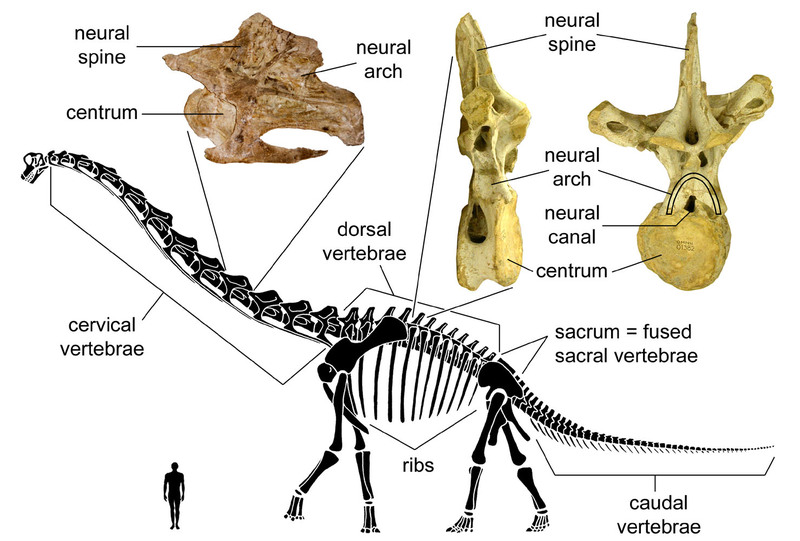 Is there a place on the site that can help in offering identifcation to a saurpod vert that has an apparent neural canal placed within the centrum rather than above it as I have noticed in diplodocus? Hi, Michael. I’m afraid we’ve had to adopt a no-fossil-ID policy: see here for details.